How Accurate are Fantasy Football Rankings? The calendar just flipped to August, meaning it’s time to get ready for fantasy football season! As you prepare for your draft, you will no doubt be looking at all sorts of rankings. But when the season is over, do you ever go back and see how accurate those rankings were? And are rankings for some positions more accurate than others? Well that’s exactly what we’re going to find out! I went back the previous 5 seasons and found ESPN’s preseason rankings for quarterbacks, running backs, wide receivers, and tight ends. I know that different publications will have slightly different rankings, but the rankings are all similar enough (especially for the top players) that using only ESPN will work for our purposes. For each season I recorded the top scoring players at the end of the season (through week 16). I recorded where the top preseason players finished at the end of the season, and also where the top players at the end of the season were ranked before the season started. We’ll analyze the data using Minitab Statistical Software, starting with quarterbacks. 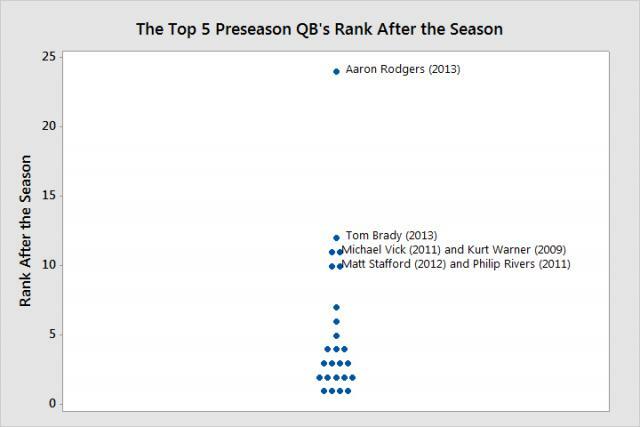 Let’s begin by looking at how the top rated preseason quarterbacks fare by the end of the season. I took the top 5 ranked preseason quarterbacks for each season from 2009-2013 and recorded where they ranked to finish the season. Here is an individual value plot and summary statistics of the results. The median value is 3, meaning that half of the top 5 preseason quarterbacks finished in the top 3 at the end of the season. That’s pretty good! The individual value plot confirms this, showing that most of the data points are clustered between a rank after the season between 1 and 4. There does appear about be about 1 quarterback a season that slips out of the top 10 despite being highly rated in the preseason. The worst-case scenario happened last year, when Aaron Rodgers (ranked #1 in the preseason) finished as the 24th ranked quarterback. Of course, this is because he missed 8 games due to injury. Injuries will always be a part of fantasy football, but they are impossible to predict before the season. But overall, you should be confident in selecting quarterbacks who are ranked high in the preseason fantasy football rankings. But what if you don’t want to take a quarterback early? Can you wait until a later round and still draft a top 5 quarterback? This next individual value plot and summary stats take the top 5 quarterbacks at the end of the season, and shows where they were ranked before the season started. Diamonds in the rough are rare for quarterbacks, as half of the quarterbacks ranked in the top 5 at the end of the season were ranked in the top 4 before the season. About 1 quarterback a year is ranked outside the top 10 in the preseason but finishes in the top 5. But some of them, like Vick and Newton, were so far off the radar in the preseason that they weren’t even drafted in most fantasy football leagues. Things get even worse if you want to draft one of the top 2 quarterbacks. 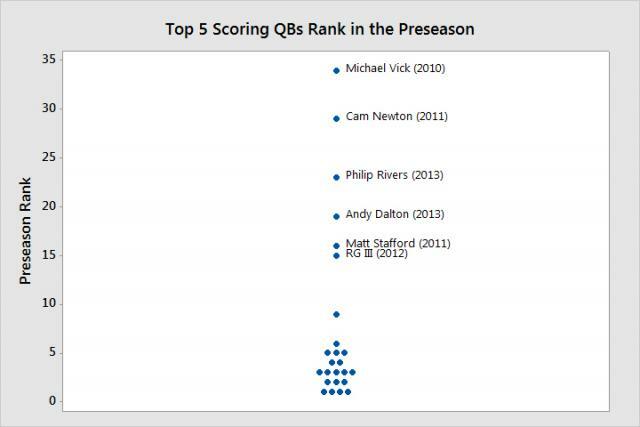 The following table shows the 2 highest scoring quarterbacks for each year, with their preseason rank in parentheses. Michael Vick aside, if you want one of the highest scoring quarterbacks, you have to take a top-ranked one early. This year the top-ranked quarterbacks are Peyton Manning, Aaron Rodgers, and Drew Brees. If you want your quarterback to be the highest scoring at the end of the season, your best bet is to draft one of those three. Now, this isn’t to say that you have to draft a quarterback early. You can certainly win your league with a lower-scoring quarterback. Just know that if you’re waiting until the later round to draft somebody like RG III or Nick Foles, history doesn't suggest that they’ll finish the season on top. But before we get too much into draft strategy, let’s move on to our next position, tight ends! I thought about just writing “Jimmy Graham” and moving on to the next position. But I already collected the data, so I suppose I might as well analyze it. 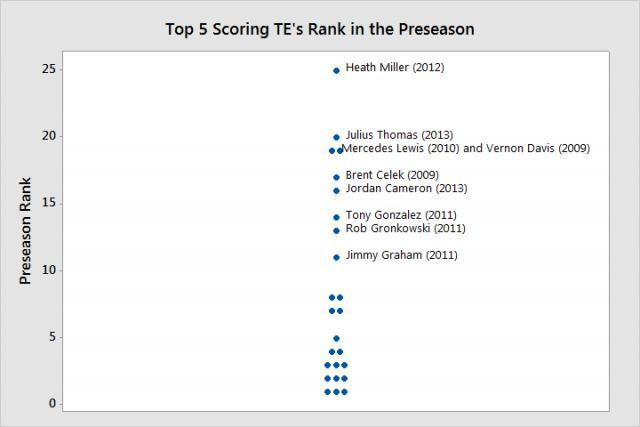 Here's how the top 5 preseason tight ends ranked at the end of the year. We much higher variation with tight ends than with quarterbacks. The median and Q3 are about two times larger than for quarterbacks. The individual value plot shows that 36% of tight ends finished the season outside the top 10, as opposed to only 24% for quarterbacks. Sometimes this is due to injury, as it was with the 3 names at the top of the plot. 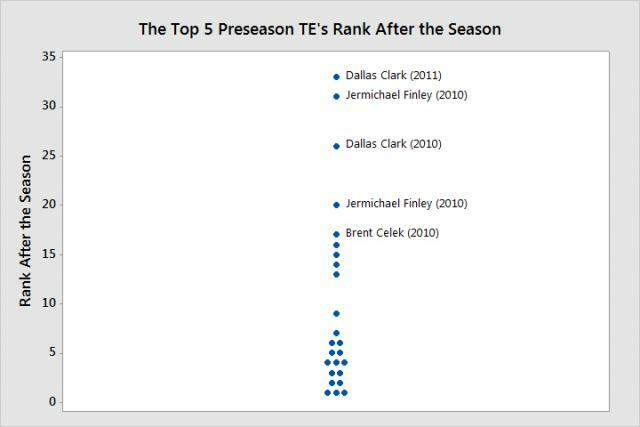 But Jermichael Finley (2010) and Brent Celek (2010) both played in every game, yet still ranked outside the top 15 in fantasy scoring despite being highly ranked in the preseason. So can you wait until a later round and still grab a tight end that will finish in the top 5? This next individual value plot and summary stats take the top 5 tight ends at the end of the season, and show where they were ranked before the season started. There are 9 different tight ends since 2009 who started the season ranked outside the top 10, but still managed to finish in the top 5. Can you believe Julius Thomas was ranked as the 20th best tight end last year? In hindsight, that seems ridiculous! And in 2011, the top 3 scoring tight ends were all ranked outside the top 10 to start the season! Will we see something similar if we just look at the top 2 scoring tight ends? Half of the top 2 scoring tight ends were ranked outside the top 5 to being the season. And of those, 3 were ranked outside the top 10! This inconsistency is what makes Jimmy Graham so valuable this year. He’s been a top 3 tight end three consecutive years. When it comes to tight ends, Jimmy Graham is as close to a sure thing as you can get. His average draft position is currently 15 on ESPN, and his consistency makes him well worth a 2nd round pick (and possibly even earlier). Julius Thomas is the 2nd ranked tight end. He should be a solid pick, but has only performed at a high level for one season (as opposed to Graham’s 3 consecutive years). Still, with Peyton Manning as your quarterback, I wouldn’t worry too much. After Thomas things get dicey. Rob Gronkowski is the 3rd ranked tight end. His upside is through the roof, but with all injury problems he’s had, there is no guarantee he’ll ever be like he was in 2012. Next is Vernon Davis, who had a great year last season but finished as the 15 ranked tight end two years ago. And coming in 5th is Jason Witten, who a season ago posted his fewest catches and lowest yardage total since 2006. He made up for it with 8 touchdowns, but if he doesn’t find the end zone this year, he could see a significant drop in his fantasy value. The average draft position for Gronk, Davis, and Witten is between the 4th and 6th round. Now compare that to Greg Olsen. Olsen is the 7th-ranked TE and is currently being drafted in the 9th round. Why did I choose the 7th-ranked tight end? Look back at the median value for where the top 5 scoring tight ends were ranked before the season. It’s 7, meaning that half of the tight ends that finished in the top 5 were ranked 7th or higher to start the season. So there is still some value at the tight end position into the 9th round and even later! To put it in perspective, Olsen is being drafted around the same spot as Maurice Jones Drew (the 32nd running back) and Kendall Wright (the 34th wide receiver). If you miss on Graham or Thomas, your best bet may be to get a quarterback and stock up on running backs and wide receivers in the first 8 rounds or so. Then take two tight ends later, hoping one of them becomes one of the players that finish in the top 5! In my next post I’ll move on to running backs and receivers. Then we’ll put all the statistics together and use them to look at possible draft strategies!